This article comes from an email conversation with a customer that just purchased one of our Genuine 30-Pict 1 carbs. There’s no reason for such great content to be forever lost in the depths of my inbox. So.. Let’s talk about how to properly install one. Words by the amazing, Jay Salser. Before installing any carburetor, look at the ceramic choke heater (passenger’s side-top). There are 3 screws securing the choke ring–which keeps the choke element in its intended position. 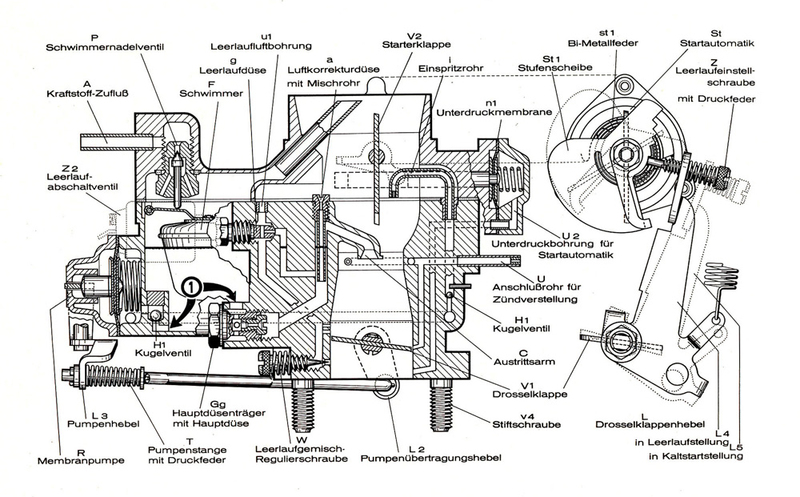 Looking into the top (throat) of the carburetor, you can see the choke valve (flapper). Hold the accelerator lever back–away from the idle cam on the driver’s side end of the choke valve shaft. Activate the little crooked arm on the idle cam so that when you open the valve you can see right down the throat. Turn the little arm loose to see where the choke valve will come to rest. This flapper valve wants to be set to close very loosely! 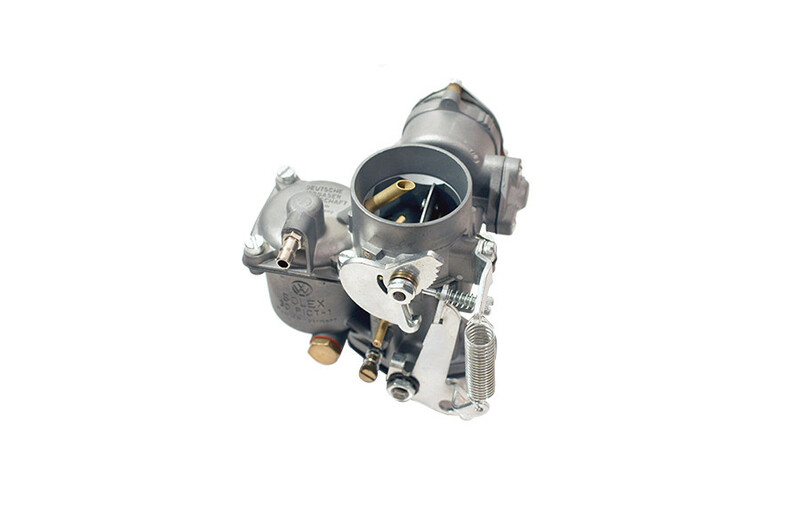 If it is set too tightly (closes hard against the carb throat), it will take the choke too long to heat and to open the valve for proper running of the engine. Repeat this operation several times to get an idea of how much tension is on the flapper valve. If it is closing too tightly, do the following. Slightly loosen the 3 screws on the ceramic choke element retaining ring. Move the ceramic choke heater slightly clock-wise–to loosen the tension. Turn counter clock-wise to increase the tension. Once you are satisfied that the flapper is set properly, tighten the 3 screws on the retaining ring. DO NOT OVER-TIGHTEN! These threads will strip easily. Just tighten firmly. Hopefully the gasket between the carburetor base and the manifold flange comes with the carburetor. When you bolt on the carburetor…..you want to snug the carb to the manifold flange but don’t try to wrench it with all of your might. The gasket will be squeezed when you firmly tighten the nuts equally. This forms the air-tight seal which is required. Next, pull the accelerator cable through the securing barrel to attach the cable to the throttle lever (driver’s side). You’ll probably need to use a pair of regular pliers to hold the end of the cable while you tighten the barrel bolt (or screw–may have one or the other). Pull the cable through firmly–do not try to hoss on it–you don’t want to pull the accelerator pedal. But, you don’t want to leave it hanging slack, either. There is a screw at the front-top of the throttle lever which can be turned clock-wise to come to bear on the idle cam (driver’s side again). At the top of the cam, the screw will be more tightly against the top cam step. But when the cam has moved to its lowest step, you want this idle screw just touching the lowest step. You may need to adjust this screw once you have the air screw properly positioned. There is an air screw on the driver’s side of the carb. Turn it in slowly until it bottoms. Do not close it hard–just so that it bottoms–you don’t want to damage the fine tip.. Now, turn the screw out 1-1/2 to 2 full turns. This should allow the carburetor to function when you start the car. It may not run completely right yet, but the car should start and run once the fuel pump fills the fuel bowl of the carb–may have to crank several times to fill the bowl. 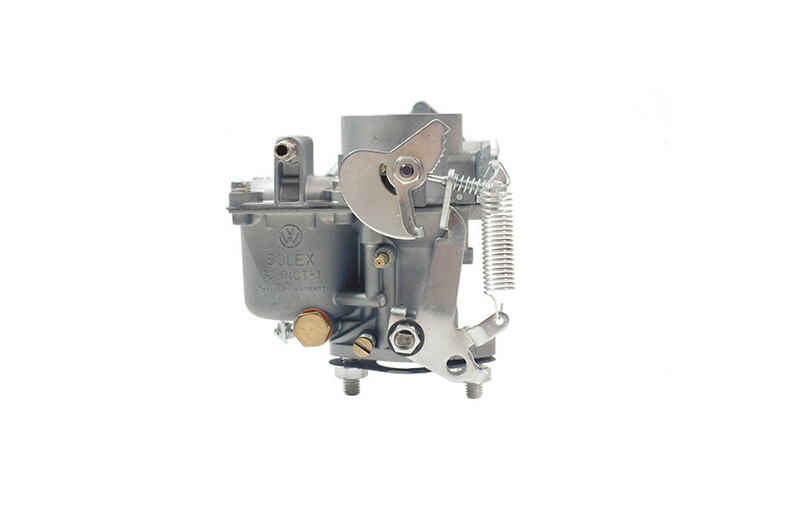 Once the car is running, allow the choke to heat to open the choke valve (flapper). This may take a couple of minutes or so. Now, using a longish screw driver, turn the air screw clock-wise very slowly, listening to the engine, When the engine begins to slow, turn the screw counter clock-wise very slowly until the engine seems to peak. Hopefully your engine will be purring by this time. I hope that I have covered the bases. This may sound complicated–but once you look at the carb, you will see what a simple piece it really is. I love these 30 Pict-1 carbs! Just found you’re web site. So great to see a 1967 only site. I have a Zenith blue 67 Convertible that I’ve restored .